March 20, 2017 | 11:20 a.m.
Lamkins: "Access does not make something affordable...we all have 'access' to luxury goods right now." 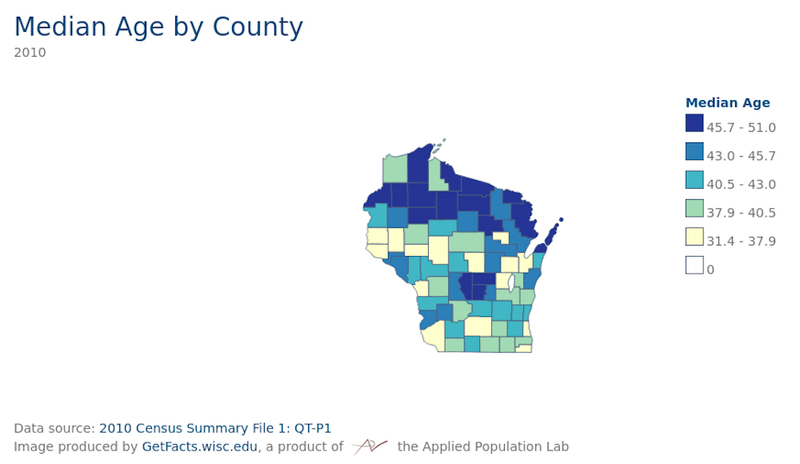 Wisconsin's population is slightly older than the United States as a whole, and its median age is projected to increase over the coming decades, especially in rural northern counties. When federal policy change affects America's senior citizens, it's safe to say that rural Wisconsinites will feel it keenly. Many such changes are in play as President Donald Trump and the Republican leadership in Congress pursue replacing the Affordable Care Act with the American Health Care Act and weighs the White House's budget proposal, which would slash support for Meals on Wheels and other programs serving the elderly. The AHCA's changes to health-insurance regulations and subsidies would put older, rural and poorer Americans at a disadvantage. In a March 17, 2017 interview on Wisconsin Public Television's Here And Now, Lisa Lamkins, federal advocacy director for AARP Wisconsin, discussed how the AHCA would change the health care landscape for elderly Wisconsinites. The AARP's stance isn't mere concern about the bill, but flat-out opposition. "It does nothing but increase cost, increase risk, really make healthcare unaffordable and unattainable for older Americans," Lamkins said. By changing limits on how much insurance providers can charge policyholders, Lamkins said, the AHCA will cause "egregious" premium increases for the elderly. One mechanism for those increases is what's known as age rating bands, which essentially set limits for how much more insurance companies can charge older people for premiums than they do younger people. Under the Affordable Care Act, companies can charge people in the 50-64 age range three times as much as they do people in the 18-24 age range. Under the AHCA, that 3:1 ratio will increase to 5:1. Another bill in the House (H.R. 708), introduced by Indiana Republican Larry Bucshon in February, would give states the power to raise that ratio to 5:1 under their own insurance regulations. "You take an average 64-year-old making a little over $26,000 a year," Lamkins said. "Right now they would pay about $1,700 a year in premiums. Under this new bill, that would be closer to $14,000 in premiums. That's huge." Given those elevated costs, she believes more people would simply go without coverage. Lamkins took issue with the notion that the AHCA would increase "access" to healthcare, which House Speaker Paul Ryan and other Republicans have used as a talking point in the face of a Congressional Budget Office projection that the law would cause millions of people to lose coverage. "Access does not make something affordable...we all have 'access' to luxury goods right now," Lamkins said. 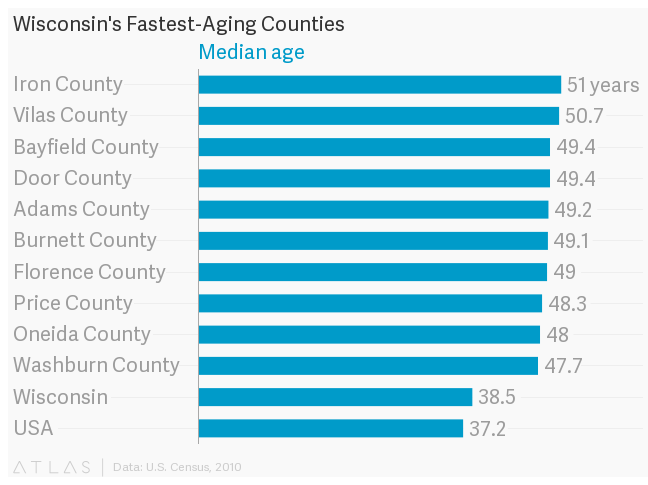 Rural Wisconsin is aging more quickly than the rest of the state. At age 65, Americans can get coverage through Medicare, but Lamkins said it's important to remember that elderly Americans also frequently rely on Medicaid. It's the latter program that covers services that include long-term care and nursing homes. The AHCA's major cuts to Medicaid would reverberate with older Americans in addition to younger low-income people who use the program. "For nursing home care, for home- and community-based services, for those things that help older people and people with disabilities, actually, with things like eating, bathing, dressing, medication management — all of that is covered by Medicaid," Lamkins said. "If the cuts that happen as part of the American Health Care Act, then those services just will not be there for the people who are really and truly depending on it." As for Medicare itself, the AHCA would do away with some taxes on higher-income Americans that flow to the program's trust fund. Those taxes have "actually extended the life of Medicare," Lamkins said, and she believes cutting them would harm the solvency of the program. That, in turn, could provide a political opening for legislators who already want to do away with Medicare or convert it into a block-grant program for states. The White House dismissed the AARP as a "special interest," but Lamkins thinks Americans are hearing the organization's message about the AHCA. "This is a message that really resonates because so many people are impacted by it," Lamkins said. "We are talking about older, low-income Americans, people in rural areas. People are worried. You're looking at 50 to 64-year-olds who are thinking, 'Gosh this is a point in my life when I really need insurance. What will happen if it's $15,000 a year?'"